During the 1830s and the Patriotes Rebellion in Canada there was a shortage of small change, which encouraged private companies to carry out several copper coins. The first token of Quebec was that of an ironmonger named John Shaw. This was a token strike on one side various tools sold in his business and the other his name and the place Upper Town Quebec. In 1838, he created pennies representing a character on the reverse wearing a sash. Even if it's the year 1837 on the token, it was really struck early in 1838 by several different banks, including Quebec Bank which produced 120,000 1/2 penny and 240,000 pennies. 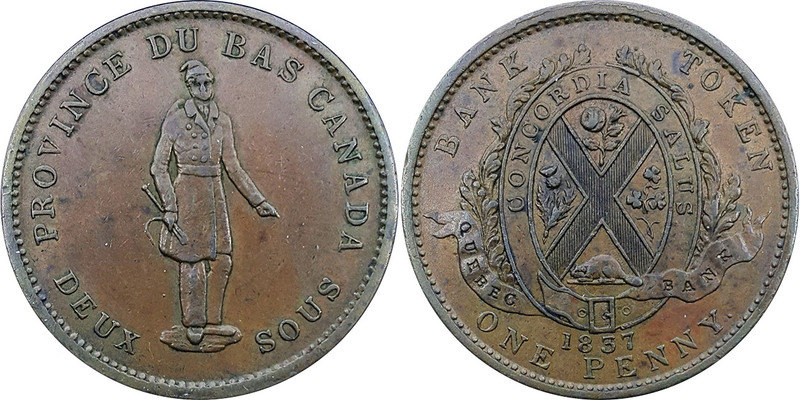 In 1852, the Quebec Bank also made a series tokens. Mintage doubled compared to 1838. The design of the token remains the same on the reverse, but the obverse bears the crest of the City of Quebec. After the creation of Canada, the vast majority of these tokens were re-struck with advertising marks like H. Gagnon & Cie, Michel Bacquet, Laval Dairy, HO Martineau, and more.